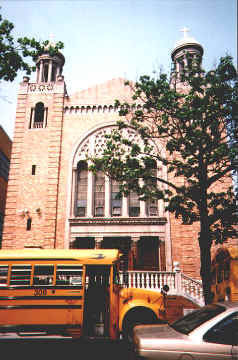 Located in Astoria, New York, St. Demetrios' Cathedral and St. Irene of Chrysovalantou serve one of the country's largest and strongest Hellenic-American communities. As part of the Greek Orthodox church, these cathedrals continue in the traditions set forth by the seventh ecumenical synod (Nicea II, 787 C E), through which the use of icons in the liturgical practices of the Eastern Church was legitimized. The reason there were two cathedrals is a dispute within the Greek Orthodox Church about the use of the Julian vs. the Gregorian calendar. 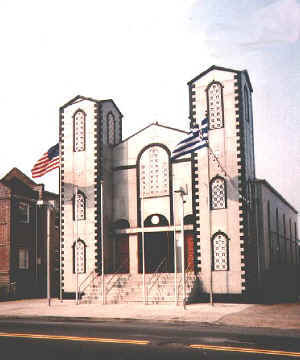 St. Demetrios is the Cathedral of the Greek Orthodox Archdiocese America, which uses (for the most part) the Gregorian calendar. St. Irene belongs to a group which broke away over this issue. 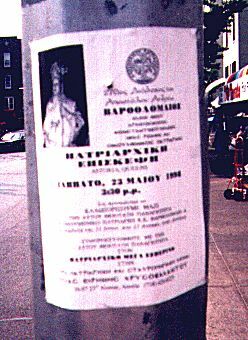 However in May 1998, the group at St. Irene were reconciled with the main Orthodox church, and at ceremony presided over by the Patriarch Bartholemew of Constantinople the Cathedral was converted to a "patriarchal and stavropegial monastery". 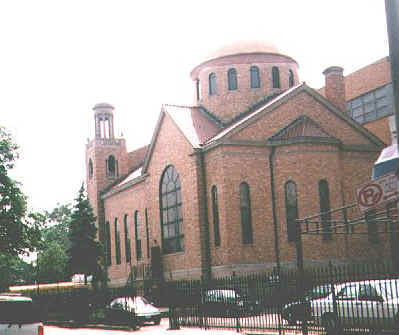 St. Demetrios' Cathedral is a slightly modernized version of a the smaller sort of Byzantine churches that were common in the later period of the empire's history. It recalls, for instance, the smaller Cathedral in Athens. It also shows the distinct influence of modern American styles, however: note especially the large windows, and the pew type seating. 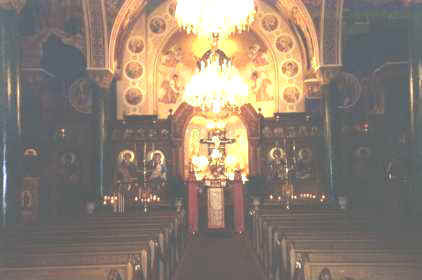 Traditional Byzantine churches do not have such windows and the congretation is expected to stand throughout the liturgy. 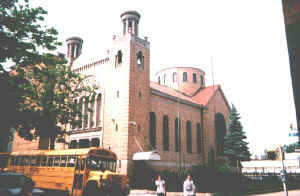 St. Irene of Chrysovalantou is simply a large modern barn type church which has been transformed into an Orthodox sanctuary. The exterior has had some Byzantine style motifs added, and the interior is a riot of devotional architecture and icons.